Me and friends from work found another place that could satisfy our late morning cravings that's classified nowhere near fast food! You probably heard of this place from some friend or a friend of a friend, aptly described as that upside down restaurant in Quezon City. 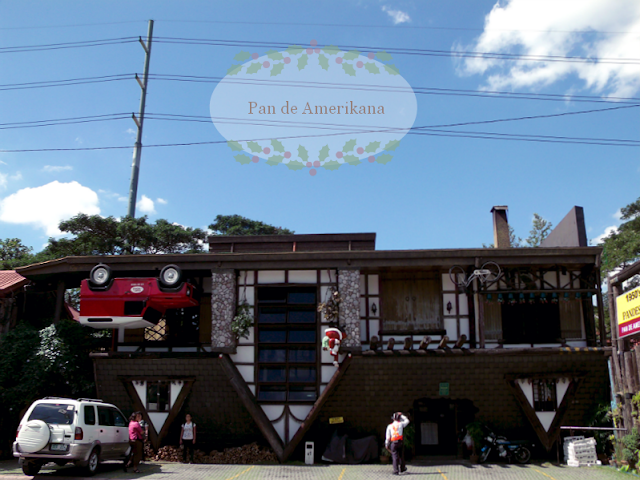 Welcome to Pan de Amerikana! It was our choice of place for breakfast because (1) most of us have never been there, (2) the restaurant theme got us really interested, and (3) food was super cheap! I got a bunch of photos of the resto's themed interiors more than the treats because I think I was there because of my curiosity of the place than curiosity of the food they serve. 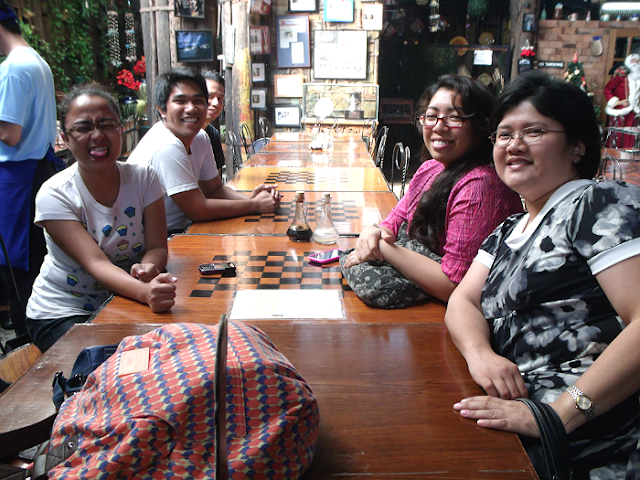 We got there past 9 in the morning and pleased that the the resto's almost empty. We sat on our preferred spot and of course, our eyes were quickly diverted to the wonders of the interior. The place was such a mish and mash of all things you can imagine. According to their website, they focus more on a 4x4 country side ambiance. Not really sure how that's supposed to look like since I don't like the rugged outdoors that much. Aside from the Land Rover 4x4 Defender 90 on the facade, there was a dining set (complete with table wares) and a piano hinged upside down. On one side, there were photos of Filipino artists covering an entire wall. Plants were hanging everywhere, little things and trinkets decorating the entirety of the interiors. Even the restrooms are decorated with bits and pieces of colorful things! If you're someone with short attention span, you'll like this place. Hahaha. Though the place was filled with decorations, ventilation was great and it still feels roomy. Actually, we've been there twice already. The first time, I forgot to bring my camera to take photos but I still managed to take a snapshot of my food (huhlolz~) using my phone. Okay. 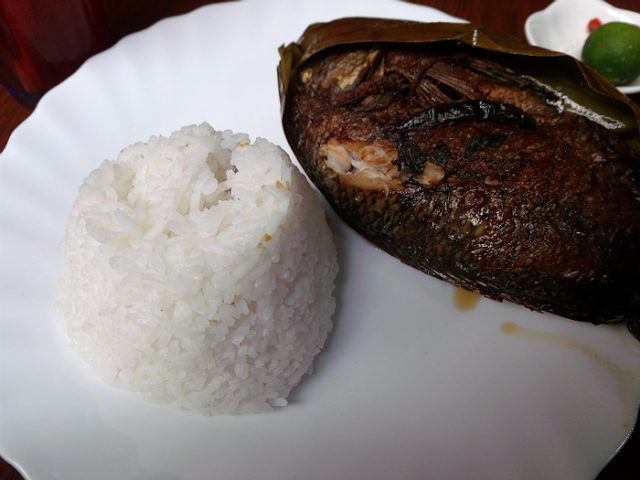 They serve super affordable food here so don't expect anything to be extraordinarily life-changing delicious, maybe except the house specialties. 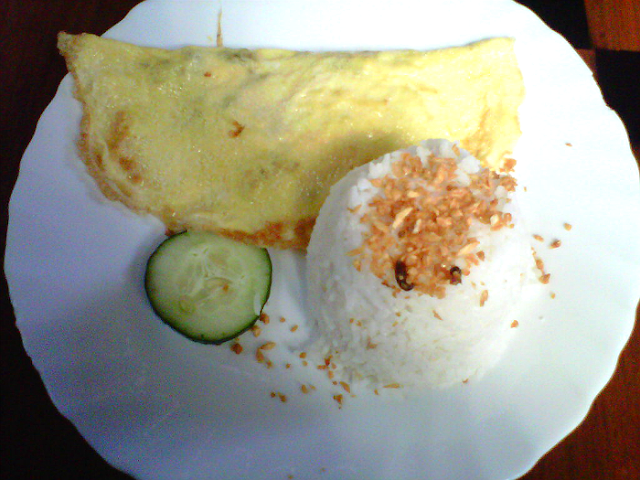 So yes, this one is regular tasting omelette and not as much cheese as I expected. The second time we went there, this is what I ordered. It was certainly nice to eat something that is not processed for a change. I enjoyed it immensely (though it needs more seasoning)! The fish was quite big, too! Although I wasn't the one who ordered this, I liked it a looooot. Everything was perfectly balanced, I loved the coconut milk goodness without going over board. I have low tolerance for spicy food that's why I loved it even more because usually, dishes like this has some added zing to it. 5 stars for Tinomok! Red iced tea was a typical one, no special brew whatsoever but super cheap. The watermelon shake was all sorts of refreshing! 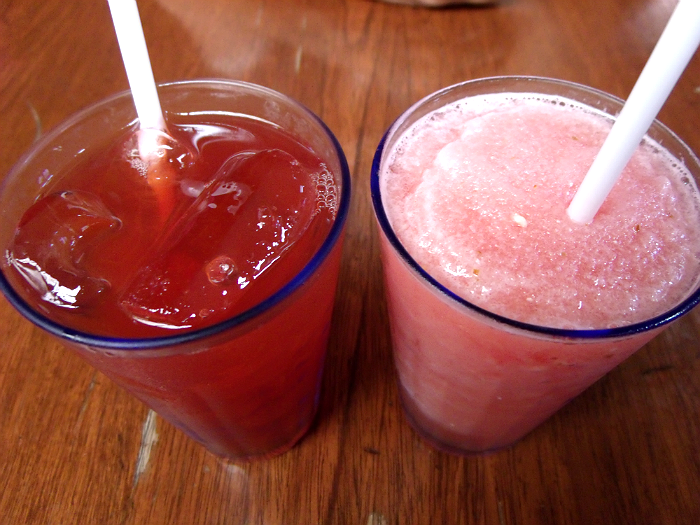 I think watermelon shakes are refreshing by default, no? 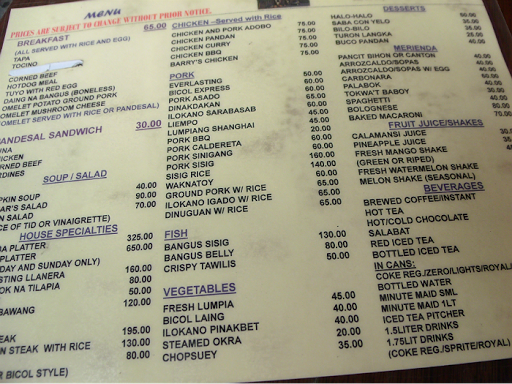 Also, try their Turon. It had strips of jackfruit inside, the outside was crispy while the banana inside feels mashed when you take a bite. Just the way I like it! I had one to go the first time we went there but I guess everybody likes Turon, it was out of stock at 9 in the morning the second time we dined there. And finally, no, I didn't buy their famous pan de sal. Haha. However, I've been reading online that it was indeed authentic 1950's pan de sal baked in a brick oven--soft and delicious. But don't take my word for it. Hehe. 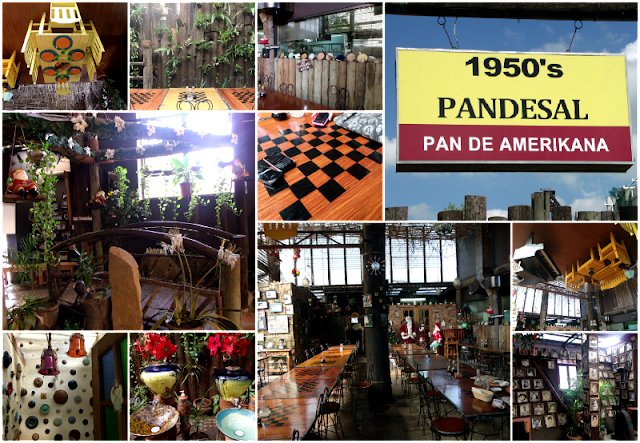 Pan de Amerikana is the perfect place for affordable food, great place with a visually stimulating atmosphere. 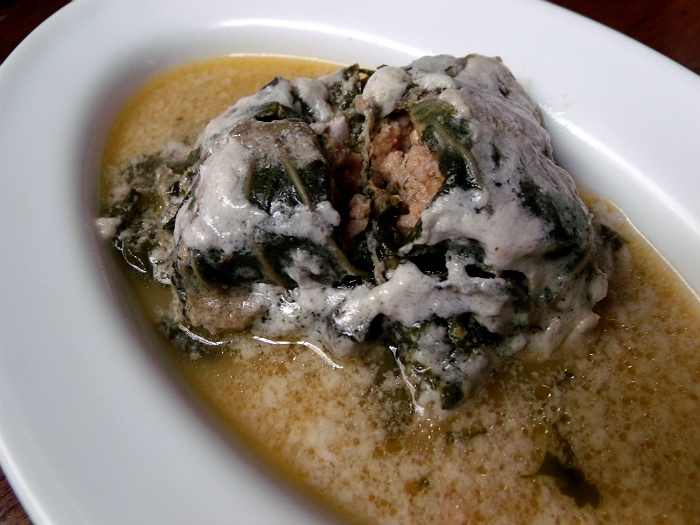 A definite twist to your generic meals at fast food chains and other restaurants. Pan de Amerikana is located at 131 Katipunan Avenue near White Plains Village, Quezon City.